A collection of 79 games to play while waiting in line. 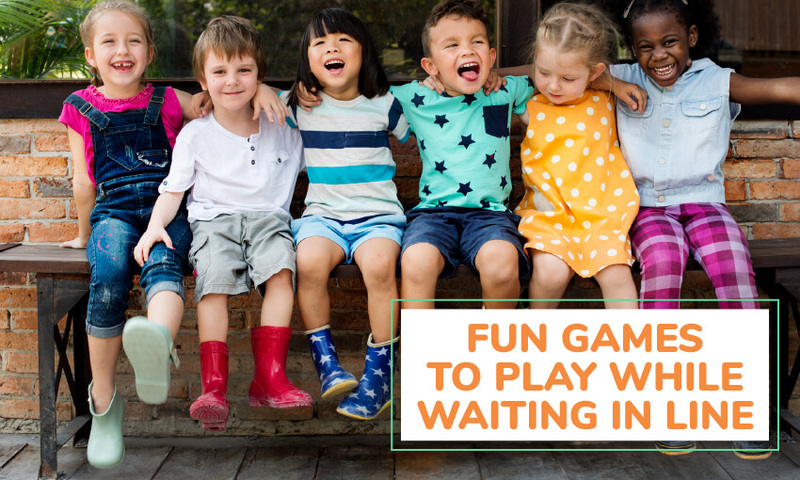 Great transition games for school age kids and games for waiting in line at amusement parks like Disneyland. Whenever you are stuck in a period of waiting, use these ideas to pass some time. Transitions should be built into our schedules-and planning is the Key! If imaginative transition activities are NOT planned in advance, there generally is an impact on programming; they most likely won’t happen and kids become disinterested. I’ve visited programs in the morning-where children are lined up for 15 to 30 minutes with nothing to do! 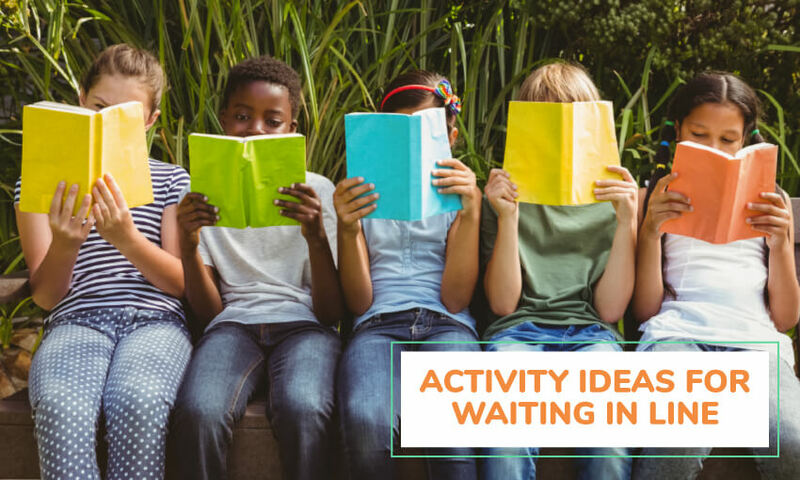 Consider some of the ideas below-and plan fun gathering and waiting times for the children attending our programs and classrooms…All you need is 5 to 15 minutes and you’ll have a time in the day that the kids look forward to! 1. CONTINUE TO READ ALOUD TO CHILDREN… GREAT AT TRANSITION TIMES! A child’s interest level is often much higher than his or her reading level. If children are to grow up loving books and reading, they need to be exposed to the most interesting books available. The SAC morning “Gathering Transition” is a good time to read chapter-books. Explain that when you say, “I spy,” every child needs to stop what he/she is doing, listen, and respond with, “What do you spy?” Say something like, “I spy children dancing in one place,” or “I spy a rock star silently playing a guitar.” The students act out that idea until you again say, “I spy.” Then all the students stop what they are doing and respond with, “What do you spy?” The game continues with you suggesting other ideas such as, “I spy children waving their arms.” After playing awhile, say “I spy students lining-up quietly.” Children may be chosen to lead the activity. squeeze is passed from person to person around the circle until it is moving smoothly. Now add sound. Squeeze and say “ooh”… and watch it go around. Next add “ah”, but with a LEFT exchange…some fun as the sounds pass over each other at the same time! • Easter or Spring: The Bunny Says…also adapt to the themes such as The Frog Says! The group does everything you do when you say “do this”…but when you say “do that”…they do NOT follow the direction. When a player follows the direction of “do that”… they are out. Stand in a circle holding hands. One person is in the middle. The person in the middle calls in some one–one at a time. The goal is to see how many people you can fit in the middle—without breaking hands. You can create your own Guinness Book of Records! All you need is a soft ball– a crumpled piece of paper will also do. Gather in a circle and give one student the ball; call out an “oddball” number which is a single digit number such as ‘5.’ Start passing the ball from student to student, counting up by ones. When a child gets the ball on an oddball number, they need to pass the ball in the OPPOSITE direction (The oddball number is one ending in your starting number. With the 5–the odd ball numbers would be 5, 15, 25, etc. Keep counting up and switching directions with the oddball number. Frequently call out a new oddball number and keep going. As you play music, have the children move in place or if there is space, have them dance around the room. Every minute or so, stop the music and the children have to freeze in whatever pose they were in when the music stopped. If they move, they sit down and lose a turn. A topic is chosen and the rubber chicken starts with one person— and is passed around the circle. The person in the middle lists as many things as they can from the topic, but they only have however long it takes for the chicken to pass around the circle once. When the chicken gets back to the starting point, the person stops talking. A designated counter should be in the group, to count how many objects were listed. The person that is able to list the most objects is the winner. Example: What are all the things that you can think of that start with the letter M? How many candy bars can be named? Or, what are things that you can buy at the hardware store. Pick high-interest topics, such as TV shows. 11. ZIP ZAP (Good for getting to know each other) “It” points to a person in the circle repeating the word “zip” or “zap” and counting to five. If “It” says “zip” the person must reply with the name of the person on his/her right—if “It” says “zap” they must reply with the name on their left. If the name is wrong, that person goes into the center of the circle. • Have your group get into pairs. • The pairs will sit on the floor, back pressed to back—and arms interlocked. • After a pair stands up, have them find another pair and all 4 must sit down and stand up. Go on as such until the entire group is together and have everyone try to stand up. This is a good game to promote friendliness and is fun when you have an exceptionally large group. Standing in a circle, students orally pass the word “zoom” around from one person to another. The activity moves rapidly to build and sustain community involvement. …..Variations can include switching directions, multiple zooms at one time, students leading zoom, and USING OTHER WORDS to build vocabulary. …..The first time, have youth sit in a circle with their legs crossed, sitting up straight with their hands in their laps. Model this posture, and ask the students to have their knees touch their neighbors’ knees to form a tight circle. 15. SILLY SALLY’S COOL CLUB! Have the players in a circle. The leader explains that Silly Sally has a cool club. The only way that kids can join— is if they can figure out what Sally likes and doesn’t like. Sally only likes things that have double letters in them. Sally likes ‘soccer’ but she doesn’t like ‘golf’. Sally likes ‘bananas’ but she doesn’t like ‘beans’. Etc. As children take turns guessing what Sally likes, the leader either lets the child in the club–or not. 16. Lie on back on the floor. A coin is placed on the nose. The challenge is to get the coin off by wiggling nose, but without moving the head. All children playing sit at a table or desk with their heads down. They cover their eyes and stick up one thumb. Seven children who have been chosen— walk around the tables or desks. Each of the “Seven” touches ONE child’s thumb. When a child’s thumb is touched, they put down their thumb. The seven youth whose thumbs have been touched stand up. They then have to guess who the one who touched their thumb was. If they’re right, they become one of the “NEW SEVEN”, replacing whoever had touched them. Need a bean bag, pencil, eraser — or similar object to place on head. Play music as each child walks around balancing the object on their head. If the object falls off the child is frozen until another comes and places the object back on the head. Everyone stops and resets their object when the music stops. Game starts over when the music again starts. During program activity time-have groups put together cheers about SAC or school. At ‘Gathering Time’ have groups perform them for each other. Also use the same idea with kids putting together a short RAP. When it’s recognized that RAP stands for Rhythm and Poetry—it is much more accepted in some programs. An easy way to start is with nursery rhymes such as ‘Mary had a Little Lamb’. The puppets can be made at SAC or purchased. Children can put together a short puppet show and perform during the group “Gathering Time”. Need magic book, props and tricks…Simple magic tricks are always fun to do. Children love the mystery that revolves around magic. Teach some magic tricks as one of your activities. During ‘Gathering Time’, children can perform tricks for each other. The above Cheerleading, Puppets and Magic can also be performed at family events! 23. What do you do with it? Or… Who uses it? Have unusual tools, utensils, shoes, hats, uniforms, etc. Ask what or who uses each one? Youth can also bring items to attempt to ‘stump’ the group! 24. BACK WRITING & DRAWING: One person sits with his back to another. The other person, using their fingers, “draws” a letter on the person’s back. At the same time, that person draws on a piece of paper what they think is being drawn on their back. 25. RAIN: The group sits in a circle. The leader starts by rubbing their hands together. The person to the right does the same and so on— until everyone is doing the action. When all are rubbing their hands, the leader starts a new sound, finger snapping, then hand clapping, next slapping thighs, try foot stomping. To END the storm, reverse the actions. At the end, the group one by one stops rubbing hands and sits and waits for the action to be completed by the group. 26. CARD NAME GAME: Write each child’s name on a playing card. While seated on the floor, distribute one card to each child –making sure no one has their own name. When their name is called they have to say something positive about the person on the card. This is a great way to help youth to respect and treat others well. Fun-and only takes about five minutes to play! 27. Choose a person to leave the room. The rest of the group stands in a circle. Choose a leader who begins and changes all movements. Everyone else should be aware of the leader but not look directly at him. Change movements when the leader does. Once everyone has the idea, call back the person who left the room. Ask him to stand in the middle and try to figure out who the leader is. Make a tape of sounds from the environment. Example: crickets chirping, cell phones ringing, water running, a thunderstorm, and a kitty meowing. When the tape is played the students are asked to identify what the noise is. Keep a numbered list for your own reference so you don’t forget what’s on it. The younger children especially like this activity. Example: Birds can fly. Rabbits can hop. Horses can trot. When the caller says something that isn’t true such as Cats can bark — any student who does the action is out. This continues until there is only one player left who becomes the new caller. For the word ‘You’ everyone in the group forms a large U. 31. Sit in a circle. One person starts a sound—holding the sound as long as possible. The next person picks it up and it travels around the circle so it becomes A RIBBON OF SOUND. Each person should pick it up and pass it on as quickly as possible. Transform it into another sound-with the person next to the one who started the first sound. Select Teams. The first person on each team goes out of the area and all team captains together make up a message. This same message will be used by all teams. On the sign to start, the first captain of each team whispers the Rumor to the next person on their team. They will whisper the Rumor to the next – and so on. The last person to receive the Rumor will run to a black board, white board, or flip chart and write the message. The team that is the closest to the correct Rumor wins. 33. MY FAVORITE SPORT: Players stand in a circle. The leader starts by going into the middle of the circle and says, “My favorite sport is jogging” and jogs on the spot. Everyone jogs until another player goes into the middle and says their favorite sport and does the body action. This continues till all the players have had an opportunity to lead. Equipment: Small random object such as keys, stone, etc. Have TWO parallel, straight, equal lines of youth, and have them hold each others hand. Have someone at the front and back of the lines watching. Place a small item in the middle of the two front people, and place it just within their reach. The back person (who is watching) says a number to the last child of each line. That is the number of times each child should squeeze the hand of the person in front of them. So if the back person said ‘2’, to the back two people—each person’s hand down the row is squeezed ‘twice’. This becomes a chain reaction, until the front person’s hand is squeezed. Once they feel the squeeze, they reach for the object in front of them. The team to grab the object first wins! Each person writes their name backwards on a file card. The cards are put in a pile in the center of the group. In turn, each person picks up a file card from the pile, and reads aloud what it says. The group must guess whose name is backwards. (Pre-make cards to use “whenever”.) Example: If the name is Mary–backwards it would be y-ram! 36. LEARN TO SING THE ABC’S BACKWARDS! Why? Just for the fun of it! Have the kids place a piece of chocolate candy in their mouth— and see how long it takes to melt! No sucking and chewing it! The one to keep the chocolate in their mouth the longest is the winner. Think of words. Children take turns seeing how many “real” rhyming words they can think of. When one word is worn out, choose another word. Remind the kids to use “nice” words only! A potato chip or cracker is placed on shoulder, while standing. The challenge is to remove the chip with tongue! One person picks something to be, such as a famous person or an animal, and then the rest of the children ask ‘yes or no questions’ until someone guesses who the person has chosen to be. 42. WRITING IN THE AIR: Have each child turn sideways with their right hand on their right shoulder. (If left-handed-do it on the left) Ask them to WRITE WORDS OR NUMBERS IN THE AIR using their right elbow. You could say, “Write (or print) your name,” “Write the name of your favorite food,” “Write your address,” etc. Then have them turn and put their left elbow on their left shoulder and continue the activity. Ask the students for ideas of what to write or have different students lead the activity. 43. GROUP STORY: You can do this on paper, or use a recorder to tell the story aloud. Have each person sit in a line or circle and take turns telling a small part of a made-up story. The first person in line starts the story and stops after a specific period of time. The next person in line picks up where the first left off, continuing the story. You can write it down and then read it aloud, or record it with a tape player or digital recorder and listen to it when you’re finished. It’s sure to get a few laughs! 46. DON’T FORGET ABOUT MAD LIBS. They’re great to do with the kids as a group! Just shout out to them, “Give me a noun—or adjective, etc.” When complete, read the Mad Lib story aloud with much enthusiasm. The children love it! Tip: You can post a chart that has definitions and examples of the various parts of speech. 47. I’M GOING ON A PICNIC: The leader Ben starts by saying, “I’m going on a picnic and I’m bringing a blanket.” Each person in turn responds with an appropriate picnic item. “I’m going on a picnic and I’m bringing _____.” Leader confirms by saying “Yes, you can bring ____” or “No, you can’t bring that” or something similar. The Trick: The first letter of the item they bring must match the first letter of their first name. So Sam can also bring sardines or salad. Cara can bring cookies or cake. Note: This is one of the easier trick games to figure out, so be sure to remind players not to tell the secret. Don’t give hints. Kids love figuring this stuff out on their own. 48. While in line, DRAW A PICTURE on your partner’s back; have him/her guess what it is. Switch guessing drawing places. “Rock” is a fist…”Paper” is a flat hand…and “Scissors” are the pointer and middle fingers making snipping motions. Partners shake their fists three times—and then show their chosen motion on the count of three. Winning hands are decided as follows: Rock breaks/dulls scissors… Scissors cuts paper… Paper covers rock. Play three or 5 times…and see who has the most wins. This is also a good method to see who goes “first” in games or gym. 51. Play the TELEPHONE/GOSSIP GAME (whisper something in a child’s ear and it goes down the line. The last person announces the message. 53. I SPY: One person says “I spy with my little eye, something that is _______ (name a color)”. Then others try to guess what the object is and the one who guesses it takes the next turn. With older kids instead of this I Spy – Play I’M THINKING OF: The leader looks about the area and says, “I’m thinking of something that is the color_________. Say what the color it is. Children guess what they think it may be. Winner is the next leader. 54. GUESS WHO: The object is to figure out who the person the leader is thinking of. The group asks yes and no questions. Questions are those such as the board game, Guess Who? Is the person a boy? Does he have brown hair? Etc. Winner is next leader. 55. 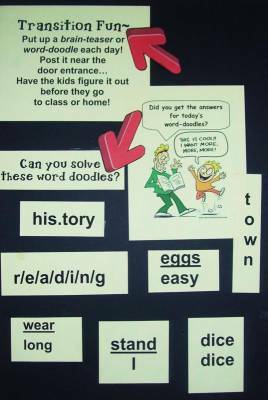 TAKE THE CHALLENGE: Post a question of the day, brainteaser, riddle, or word-doodle on a portable chart holder or white board near the door. When youth line up, have them focus on the challenge… Who can solve it? Also near the line up area put up a Graffiti Wall or Question Wall. The kids can write on it as they wait. Start off with what makes you happy —and then take turns calling out things such as: Sunny days make me happy; Sunshine makes me happy; Warm cookies make me happy; Saturday mornings make me happy; Friday nights makes me happy….. Going to the movies makes me happy…..Pizza…..Going on vacation…..Blue skies…..Summer time, etc. When done in a light-hearted manner, the children will join in and share! You’ll be amazed how the atmosphere can change—as well as realizing it doesn’t have to be a trip to Disney World to do it! The leader needs a helper who understands how the trick works. The helper leaves the room. While the helper is out of the room, the group decides on an object. The helper then comes back to the group; her/his task is to guess what the object is. The leader asks the helper questions like, “Is it the table?” or “Is it the bench”. The trick is that the object will be THE FIRST ONE AFTER A BLACK OBJECT. 58. GUESS THE NUMBER GAME: The leader picks a number within a range and youth try to guess the number. Example: Leader says, “I’m thinking of a number between one and 50”. Leader can say “higher” or “lower” as the children guess. Correct number guess is the next leader. Roll their tongue (85% of people can). Wiggle their ears; wiggle their nose. Show they are double jointed. Touch their ear with their elbow (I don’t think anyone can!). Whistle (can they whistle by blowing both in and out?). Twiddle thumbs (try to do it in both directions at same time!). Rub their stomach and pat head at same time. Make owl hoots with clasped hands. Make a “popping sound with hand tapping their puckered large “O” shaped mouth. Invite children to create their own versions of the transition activities! Tip: If a child is starting to become a challenge, put him/her in charge of a game or go first. It often will change the behavior. 60. GUESS MY RULE: Use this deductive reasoning game when kids are waiting. The object is for students to figure out the rule you are using to sort them into groups. Example: Call out a number of kids all wearing “blue”. When the youth guess they are all wearing blue—call out another similarity—such as all in 5th grade or all having brown hair, etc. Children line up by their birthday month. They can line up as born from January to December. They can line up by hair color: Lightest to darkest or darkest to lightest. Etc. While waiting for the group to line up, an adult can lead the children along the room in a game of Follow the Leader. 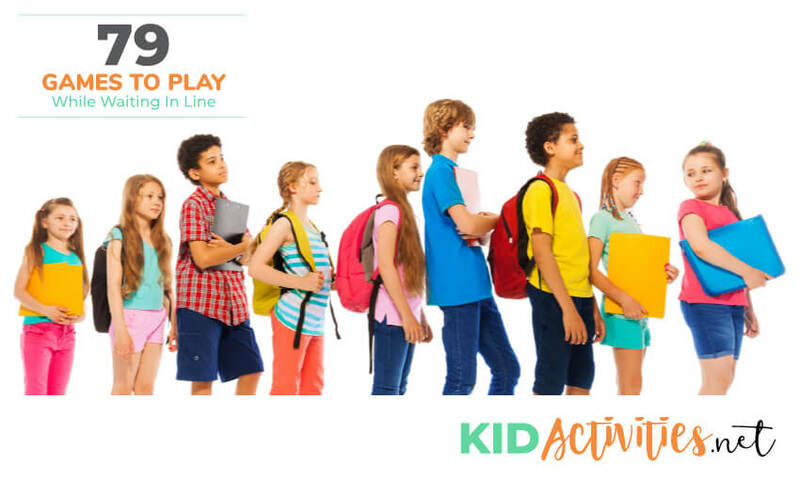 While “Leading” all children join the line and proceed to the line-up point. 64. Randomly CHOOSE NAMES FROM A BASKET to send a few students at a time to line up. Reverse the order the next time so that students who were called on last will be called on first the next day. 65. Pre-K-K: Spell students’ names aloud and allow them to line up when they recognize their name. 66. NUMBERS CALL: Have the group line up and count off—remembering “their” number.The leaders begins by calling a number—such as “two”. Person “2” then calls out a different number, and that person must respond. If someone makes a mistake such as calling out a number that is higher than the number in the group—calls out their own number—or delays, they must move to the end of the line. The goal is to be at the head of the line. Nobody is ever out and there is always the chance of moving up! 67. A version of “I SPY”— which is #2 –and also” Hopping Challenge” which is #22—are unique ways to line up! 69. WHAT AM I COUNTING? Have one person start counting aloud an object in everyone’s view: Windows, white shirts, tables, etc. Can your group guess what the person is counting? As a variation, name an object and challenge the group to count as many as they can find in one minute. Choose a category such as animals, vehicles, countries or food. Each person is to name something that belongs to that group. Challenge group to work in A to Z order: ant, bee, cow. Or, you can name items like hammer, saw, level and the child responds with “tools.” One more option is to have each word begin with the last letter of the previous word: Japan, Netherlands, Somalia, etc. Stand up in a line or circle. Have each person trace a simple shape O, X, 1 – on the back of the person standing in front of them. Can each person guess what was drawn? Also you can draw your own version of a funny face. The person being drawn on- visually imitates the expression drawn on his or her back—and draws a silly face on the next person. How accurate are the faces to those drawn on the back? Give everyone a pencil and paper and describe an object for them to draw. “Draw a square. Now draw an oval in the upper right-hand corner of your paper…” Keep adding objects. When complete-compare their pictures to yours and see how accurate they were. A variation on this is playing connect-the-dots on white board/chalkboard. The first person draws two dots and a line connecting them. Each person adds a dot and draws a line from one of the previous dots to his dot to make a design. This activity can also be done by passing a piece of paper and a pencil down the line. Each person adds to the group picture. 1. Everyone sits facing the leader. 3. The chosen player must come up with the name of an animal that fits the category before the leader counts to ten. 5. If the player does not respond in time, he/she is out. 6. The game continues until only one player remains. After a few rounds it can be hard to think of an animal that has not already been mentioned! 74. Have a ______(Blank) of the Day–Each Day! This could be a doodle, riddle, trick question, joke, definition of a word or quote. Brains crave variety and incorporating activities such as this, will certainly go towards some cognitive variety! Each month or week, change out “What the _____of the Day” will be! As written above, it could be the puzzle, a word definition, riddle, trick question, or quote. Great for all school ages to high school! Just put the _______on a black board or white board near the room entrance. By the end of the day—discuss guesses and answers. 1. Using a picture of an animal, children’s character or personality, cover the entire picture with puzzle pieces to hide identifying features. 2. Take one piece off at a time; children guess who/what is underneath. 3. This can be done as a group game, individual or team play. It could also be set up in a special daily spot–with guesses being made as removed pieces reveal who/what it is! 4. Depending on how you play this-points can be added or subtracted. The most points of course going to the individual or team who correctly guesses with the least amount of puzzle pieces removed! This is a good game for unwinding and quieting down the group. 1. Players lay on the floor in any position they choose. 2. Make sure each player has enough space as NOT to touch each other. 3.When kids are ready- count to three to signal that the game has begun. At “3” children must remain quiet and not move! 77. TAKE A DRAWING BREAK! Have 5-10 minutes to kill? This is one of the all-time great party tricks. Any nose and spoon will do. Breathe heavily on the spoon, or lick it (yuck!). Immediately after breathing on or licking the spoon, place it on your nose so that it is up high, but not too high. It can basically be placed anywhere on your nose, as long as it is on the ledge of it. Place it on the edge of your nose. Sounds easier than it really is. No laughing, no poking, no nodding, noblinking–just staring into the eyes of your opponent to see who flinches first.